Vancouver, B.C. - Beginning May 17, 2005 all of GolfBC’s 9 Golf Courses in British Columbia will have selected tee times available for junior golfers under the age of 16 to play free, with a paid adult round of golf. “Kids Play Free at GolfBC” is the first of many initiatives that will be launched by GolfBC over the coming months, under the new banner “Learn to Play and Play More Often”. “Kids Play Free at GolfBC” will be available at the courses 7 days per week for the 2005 season, based on availability. The courses offer a variety of rates based on the time of day, and an adult green fee may fall into special twilight times further making this program affordable for all families. 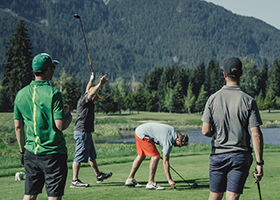 Participating courses are Nicklaus North, Furry Creek, Mayfair Lakes, The Bear and The Quail at The Okanagan Golf Club, Gallagher’s Canyon and The Pinnacle, Arbutus Ridge, and Olympic View. “This program, Kids Play Free at GolfBC, is a wonderful opportunity for GolfBC to give back to junior golf while helping to promote our main business focus, The Great Game of Golf ”, said GolfBC Executive Vice-President Donald Lee. “We are committed to bring more players into the sport and are excited to launch this program at our 9 British Columbia properties”, he added. For more information on Kids Play Free at GolfBC, visit our website at www.golfbc.com/special_offers/kids_play_free.